Based on the strong reviews it’s getting, I expected to like “Spotlight,” the new movie about the Boston Globe‘s investigation of the priest sexual abuse scandal within the Catholic Church. But I didn’t anticipate regarding it as one of the best suspense dramas ever made about crusading reporters chasing a blockbuster story. 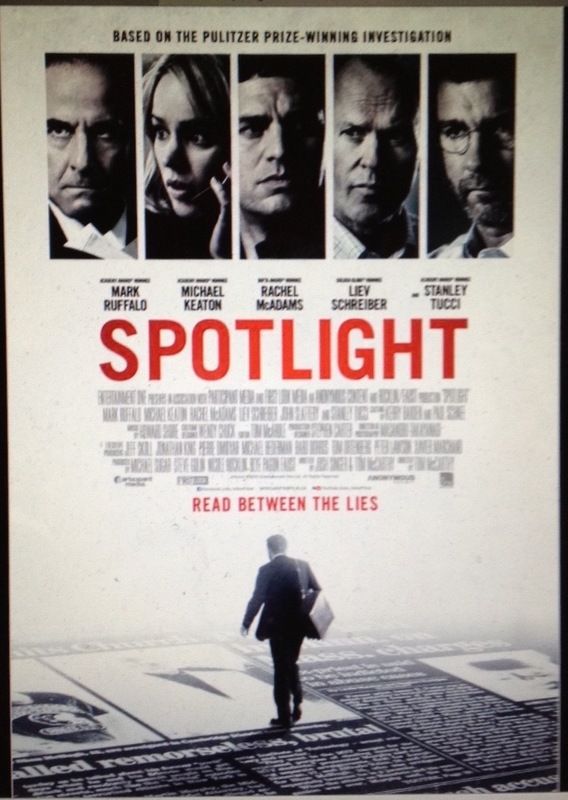 By the time it ended, I had already concluded that “Spotlight” compares very favorably to “All the President’s Men,” the 1976 movie about the Washington Post‘s role in exposing the Watergate scandal. In fact, I think it’s the better of the two. The movie’s title refers to the Globe‘s Spotlight investigative team, which spent months pursuing leads and interviewing individuals before going public with its findings in January 2002. Although the Globe was not the only journalistic player in this saga — Kristen Lombardi of the Boston Phoenix alternative weekly actually did a lot of the initial reportage on this matter — it took the dedicated resources of the Spotlight team to blow it wide open. The individual performances in “Spotlight” are outstanding, and I anticipate that several of the lead actors will be prominent at Oscar time. Michael Keaton (editor “Robby” Robinson), Mark Ruffalo (reporter Mike Rezendes), Rachel McAdams (reporter Sacha Pfeiffer), Liev Schreiber (editor-in-chief Marty Baron), and Stanley Tucci (lawyer Mitch Garabedian) are among those who deliver serious, believable, and understated performances. The movie doesn’t pull punches about the gruesomeness of what occurred here. Nevertheless, it avoids lapsing into overly prurient detail or Catholic-bashing. It lets the story speak for itself, ranging from the impact of sexual abuse on the victims, to the enabling culture of a city, to the powerful institutional role played by the Church in attempting its cover up. Of course, I may be biased in my praise. 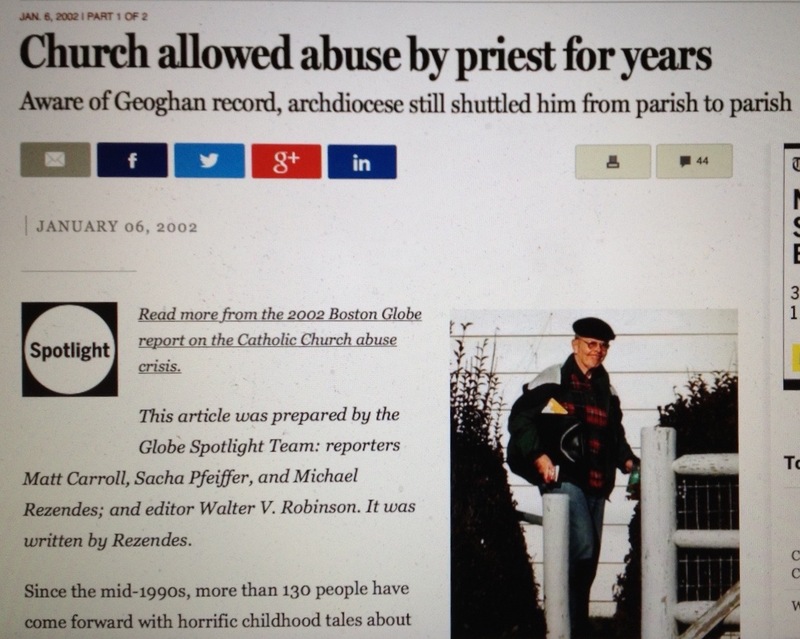 After all, I’ve been living in Boston for some two decades, and I remember well the Globe‘s work in uncovering the priest scandal. That said, this is really, really good Hollywood moviemaking. “Spotlight” mixes superb drama with an authentic look & feel, and it ultimately it drives home a bigger lesson about powerful institutions run amok. I’m really looking forward to seeing this.